I've spent about 4 days building this case now, in hours, maybe 20. I know, it sounds like a lot. Some of it is due to mistakes you're bound to make when you do this sort of thing for the first time. Cutting wood is a time consuming job, again sometimes due to mistakes having to cut things twice, but haven't lost a lot of wood to the bin yet. Since all the wood is covered you can get away with a lot of bad cuts and rough edges. Making the 8 corner protectors was quite some work, maybe 1,5 hours, cutting disc shapes out of aluminium using scissors, drilling 4 holes, bending the piece, sanding it. Moneywise, spent about 25 euro (32 dollars? 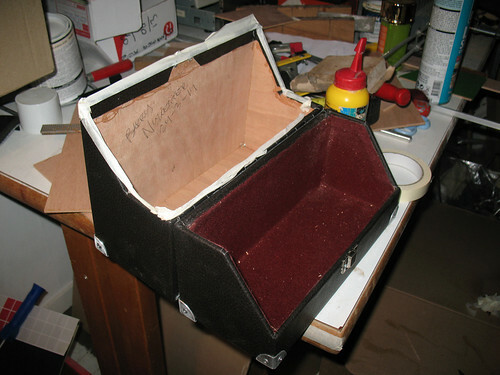 ), leather and felt being the most expensive part, used a lot of glue also, about 5 euro worth. Wood was 5 euro as well. Aluminium sheet I still had in storage as well as rivets. Note to self, try to slow down a bit. Today I wanted to fit the first pieces of red felt but hadn't thought it through and ran into trouble when having to remove felt after it was glued down, not a pretty sight I tell you. 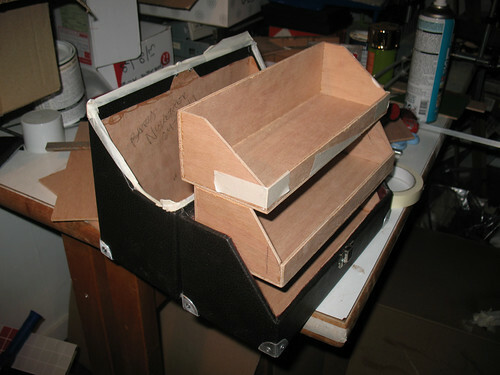 Anyway, today also started on the inner trays that the case will hold, 3 of them. And immediately ran into a small problem. I had envisioned 3 equal trays, however, due to the way the lid closes there wasn't enough room to make 3 equal ones that are stackable. So the top one will be a little bit different to allow the case to be able to close. 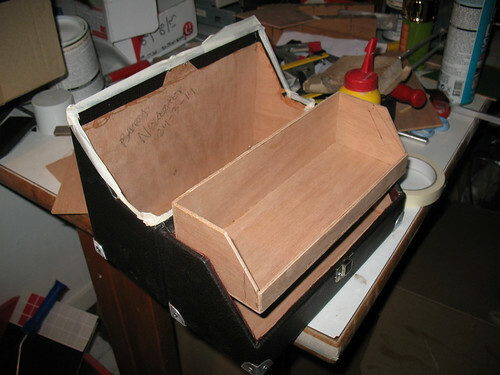 Same procedure as the case, glue multiplex wood together to form a box. I use 90 degree angle shaped pieces of wood to keep pieces in the correct allignment when drying, using clamps. Using painter's tape also helps a lot to keep some tension on keeping pieces stuck together while drying. 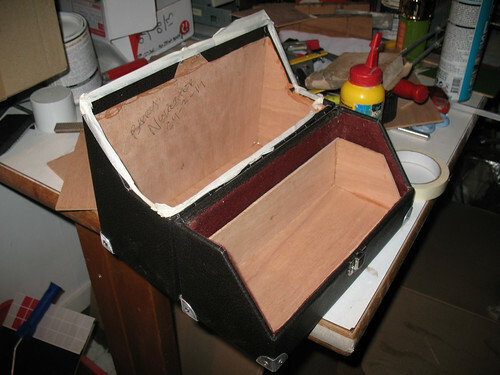 You may be wondering why I haven't put felt in the top part of the case yet, that's because I still have to decide about a handle that will need to be fixed to the top and also I might need some kind of foam in there that will keep my trays from bouncing around when the case is closed.